Regan Baker Design worked with our second time SF-based client, contractor Markus Burkhardt and Sagan Design Group to design, build and furnish an understated and inviting 5 bedroom, 3.5 bath cabin to comfortably host a family of five, as well as extended family and friends! Our client loves shopping for vintage home goods, and has a lovely collection of family heirloom quilts, so we incorporated both into this cozy family home. Most excitingly, this getaway home is Tahoe's first passive house-- Energy efficient, comfortable, affordable and ecological all at the same time-- a relatively new construction concept. 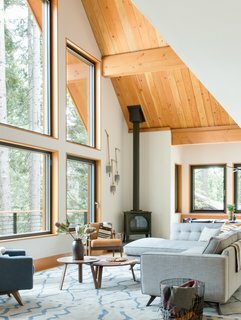 Regan Baker Design uploaded Woodsy Tahoe Cabin through Add A Home.